These Best of Show winners represent the pinnacle of achievement across all industries. The Web Marketing Association is pleased to help set the standard for Internet excellence with the IAC Awards by highlight the best in online advertising by medium and industry. The Web Marketing Association recognizes the agency that demonstrates consistent excellence in online advertising development by winning more IAC Awards than any of their peers in a single competition. Each entrant was awarded points based on the level of award for each award received. The agency with the most points is awarded the Top Agency Award. TMV Group is recognized with the 2019 Top Agency Award, winning 21 IAC Award winning entries, including a Best of Show award, 15 Best of industry awards 5 Outstanding awards and a total of 115 quality points towards the Top Agency Award. TMV Group is a Detroit-based independent branding agency focused on creating strategically grounded creative in digital, social media, broadcast and website design. The Web Marketing Association is now accepting entries for the 23rd annual WebAward Competition for Web site development. Deadline for entry is May 31, 2019. 1) They have been penalized algorithmically, meaning their site has drawn the unwanted attention of a Google algorithm like Panda or Penguin. These algorithms are designed to decrease website rankings when they find things like low quality content or spammy links. 2) They have been penalized manually by Google. Usually this is the result of their previous SEO company having engaged in blackhat link building tactics. We recently had a new client reach out to us because he suspected his current web development company was doing something illegitimate to his site, which was causing it to lose traffic. He had recently relaunched his website with a modern and responsive design, and he had signed up for SEO with the same company. 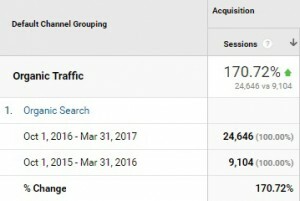 However, aside from some recent positive traction, organic traffic wasn’t nearly what it had been in previous years or even recent months. In fact, it had decreased significantly. Our client was fairly SEO-savvy, so right away he noticed that some things had not been done with the new site, which raised some major red flags. Missing redirections. A lot of the old pages had not been redirected to the new pages on the site. This means the SEO value of the old URL’s was not being passed to the new URL’s. Missing alt text. Many of the images were missing alt text, which provide essential information that allows blind or handicapped users to browse the site. Slow website speed. Our client believed his website seemed slower than it should have been. Needless to say, he wasn’t satisfied with the results and depth of knowledge exhibited by his previous company. SEO Inc. resolved to work with our new client to restore his rankings to a consistent level and increase his organic traffic using legitimate, proven SEO strategies. We would perform an audit of his entire website, essentially leaving no stone unturned as we inspected his site on a page-by-page basis as well as on the whole to root out and remove toxic links. We would also aim to improve his on page optimization, leveraging unique content and keyword distribution to enhance relevancy and authority for his pages. Once we could review the client’s website in depth, we made a startling discovery – his previous company had been building links to his website using black hat SEO tactics. They had used a common tactic called a Private Blog Network (PBN). This was a network of WordPress sites this company owned and operated, and its sole purpose was to publish articles that would link back to their clients’ websites using exact match, money (high value) anchor text. 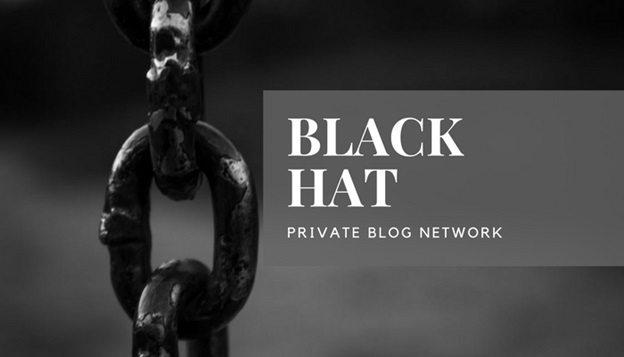 This PBN was particularly easy to identify, as all the sites under it linked to each other and pointed back to this company’s website as well – a clear sign of black hat webspam and of trying to “cheat” the ranking system. Because we could identify the PBN so easily, we knew it was only a short matter of time before Google would crack down on our client, having issued manual penalties in the past for using PBNs to artificially inflate rankings. Once our client came onboard, we performed a thorough link detox of his site. This process involved looking at each backlink pointing toward his site and immediately disavowing the PBN sites. In the days and weeks following the Google algorithm Penguin 4.0 (which targets webspam in real-time and rolled out in fall of last year), we saw a noticeable increase in organic traffic to our client’s site. Another challenge was to correct our client’s 404 errors that his previous company had ignored. Optimizing the website’s page speed and load times became another large focus of the project. We did indeed find that the website was performing at a less than ideal speed, which when combined with the lack of redirects, would make for a poor user experience and reduce the sites organic visibility. We worked to make sure that all our client’s old URLs were redirected to their new counterparts. This would allow the pages to carry over the “link juice” value to the new site, preserving the flow of traffic from the old pages to the new. We took advantage of several newer technologies to take the website’s page speed to new levels, specifically HTTP/2 and PHP7. HTTP/2 replaced the older, slower HTTP website protocol, while PHP7 provided a stronger scripting language for web development purposes. As for his images, we compressed all of the images on his website losslessly using the WordPress plugin WP Smush and used W3 Total Cache to combine and reduce the number of CSS & JS resources used. This would cut back on the amount of scripting needed to load the website. We also added descriptive alt text to his images, optimizing them to be able to be understood by users with disabilities and adhering to ADA standards. Once we had taken care of the mission critical SEO tasks, we could shift our focus to his on page optimization. His previous company had implemented a damaging keyword strategy that goes against Google’s guidelines. We found numerous instances of overlapping and duplicated keywords in his meta tags and headers. Since so many pages shared the same focus keywords, a lot of his pages were prevented from ranking for additional key terms. We discussed with our client how to ensure a strong keyword strategy for each page by positioning the keywords to target a specific service or topic. Then, we incorporated them into unique content with no overlap between pages. These additional formats allowed his site to gain added value from Google’s search results listings, as they are now eligible to be featured in prominent sections on the page. Last but not least, we took a purely white hat approach to building links to our client’s site. Unlike the previous company’s tactics of forging backlinks using an illegitimate PBN, we wanted to provide real value to his website and his visitors by building links that were related to his industry. We were able to leverage services such as HARO (Help a Reporter Out), which connects journalists with experts to answer their questions using thorough research and know-how to create the foundation for a strong link profile for our client. We are thrilled to have helped pull our client out of his SEO troubles, securing his site and making it more appealing to human users and search engines. Winners of the 21st annual WebAward Competition will be publicly announced on the award program website on September 7, 2017. At this time, the Web Marketing Association will announce the Best of Show winner as well as Top Agency winner. In addition, we will announce the 96 Best of Industry winners as well as the Outstanding Websites and Standard of Excellence winners. The Web Marketing Association is pleased to announce the call for entries for its 6th annual international MobileWebAward competition. It recognizes the individual and team achievements of Web professionals all over the world who create and maintain outstanding mobile Websites and mobile applications. The deadline for entry in the 2017 MobileWebAwards is September 29, 2017. The entry form for this award program can be found at http://www.mobile-webaward.org. The MobileWebAwards were judged on seven criteria seen as requirements for a success mobile website or mobile app. They include Creativity, Impact, Design, Content, Interactivity, Ease of use and Use of the medium. Each mobile website or mobile app entry is judged against other entries of the same format in its industry category and then against an overall standard of excellence. A “Best of Industry” MobileWebAward will be given in each of the 96 industry categories, including financial services, medical, small business, travel, advertising, transportation and government. The competition’s highest honor, the 2017 MobileWebAward “Best of Show,” will be given to the one best mobile website and one best mobile app that the judges believe represents the pinnacle of outstanding achievement in Web development. 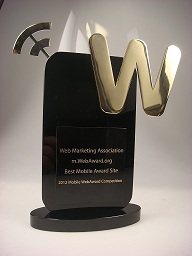 Each organization that wins 5 or more MobileWebAwards will be awarded an Outstanding Mobile Interactive Developer trophy. TMP Worldwide won Best of Show Mobile Website for Unexpected Accenture – You View, which also was recognized as Best Employment Mobile Website. Unexpected Accenture – You View’s goal is to get people excited about a career in technology by bringing case studies to life through the people who worked on them. Ormco Corporation won Best of Show Mobile Application for Bethany Hamilton Damon™ Smile Emoji Keyboard, which also was awarded Best Mobile Mobile Application. The Bethany Hamilton Damon Smile Emoji keyboard is the first app that supports teens and adults undergoing orthodontic treatment by leveraging the power of mobile messaging apps to enhance the power of self-confidence. Two organization were recognized with the Outstanding Mobile Interactive Developer for winning five or more MobileWebAwards. They were TravelClick Inc, and TopSpot Internet Marketing. Judging for the 2017 MobileWebAwards will take place in October and winners are expected to be announced in late December. Judges will consist of a select group of Internet professionals who have direct experience designing and managing mobile Websites,–including members of the media, interactive creative directors, site designers, content providers and webmasters – with an in-depth understanding of the current state-of-the-art in Web site development and technology. Past WebAward judges have included top executives from leading organizations such as A&E Television Networks, Agency.com, BGT Partners, Worldwide, The Cincinnati Enquirer, Comedy Central, Disney, Euro RSCG, Ion Global, J. Walter Thompson, John Deere Company, New York Post Interactive, Organic, Inc., Refinery, R/GA, Saatchi & Saatchi, SAP, Starwood Hotels, Sun Microsystems, Warner Bros. Online, Xerox and Website Magazine. The 2017 MobileWebAwards are sponsored by the following leading organizations: Website Magazine, PR.com, iContact, EContent Magazine, and SEO Inc. The Web Marketing Association thanks these companies for their commitment to the entire online marketing community. Once you’ve won an award for your work, it’s important to do everything you can to promote that win, both inside your company and without. 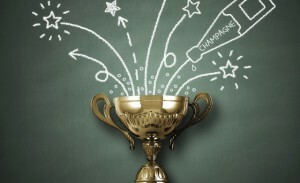 Awards Finder is a new website that was designed to help marketers find award programs that fit their marketing needs. They also offer the ability to promote the awards you have won with a post on their Awards Finder Blog. To submit your award for consideration, use this short form to submit your details to Award Finder. These Days is recognized with the 2017 Top Agency Award, winning 10 IAC Award winning entries, including three Best of Show awards and a total of 66 quality points towards the Top Agency Award. Founded in 2001, These Days is an integrated, multidisciplinary communication agency with 150+ employees delivering services (strategy, creation, production, media, analytics) to customers worldwide. The Web Marketing Association is now accepting entries for the 21th annual WebAward Competition for Web site development. Deadline for entry is May 31, 2017. 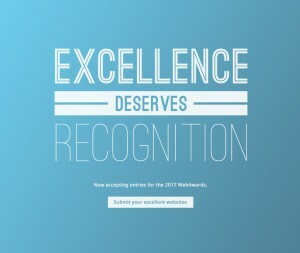 Excellence deserves recognition and the Web Marketing Association is pleased to announce the call for entries for its 21st annual international WebAward competition. The WebAwards are the standards-defining competition that sets industry benchmarks based on the seven criteria of a successful Web site. It recognizes the individual and team achievements of Web professionals all over the world who create and maintain outstanding Web sites. The deadline for entry for the 2017 WebAwards is May 31, 2017. A complete list of past winners and this year’s entry form can be found at www.webaward.org. The competition’s highest honor, the 2017 WebAward “Best of Show,” will be given to the one site that the judges believe represents the pinnacle of outstanding achievement in Web development. Last year’s Best of Show winner was BETC Paris for their outstanding work on The End of Society Simulator. The site was also recognized as Best Entertainment Website and Best Media Website and Best Mobile Website. The Web Marketing Association will also recognize the interactive agency winning the most awards in the competition with the “Top Interactive Agency” WebAward. TravelClick, Inc. was named Top Agency at the 2016 WebAward Competition, taking home 29 WebAwards in 2016. The Top Agency Award is given to recognize the consistently outstanding development going on at interactive firms. The WebAward Top Agency award recognizes consistency of effort and is given to the interactive agency that wins the most WebAwards in a given year. All locations and offices of a specific agency will be consolidated for the purpose of determining the winner of this award. Each entrant will be awarded points based on the level of award for each award received. A Best of Show will be worth 10 points, Best of Industry 5 points and each Outstanding award 3 points and a Standard of Excellence 1 point. The agency with the most points will be awarded the Top Agency Award for 2016. Each year, many agencies and some corporations win multiple awards and deserve additional recognition. This year, we will recognize each organization that wins 6 or more WebAwards with an Outstanding Interactive Developer trophy. In 2016, there were 14 agencies recognized with this prestigious award. Interactive and advertising agencies that win a 2017 WebAward will automatically be included in the Award Winning Agency Database with a free premium listing. Judging for the 2017 WebAwards will take place in June through August and winners will be announced in September. Judges will consist of a select group of Internet professionals who have direct experience designing and managing Web sites,–including members of the media, interactive creative directors, site designers, content providers and webmasters – with an in-depth understanding of the current state-of-the-art in Web site development and technology. Past judges have included top executives from leading organizations such as Universal McCann, SapientNitro, T Rowe Price, Bridge Worldwide, Disney, Euro RSCG, Boeing, Huge, ING Direct, VML, Facebook, J. Walter Thompson, Gartner, Possible Worldwide, YUM!, Cuker Interactive, PayPal, Razorfish, Munich Re, Refinery, Ernst & Young, Magellan Health Service, Microsoft, R/GA, Family Cookbook Project, Saatchi & Saatchi, SAP, Starwood Hotel, and Website Magazine. The 2017 WebAwards are sponsored by the following leading organizations: EContent Magazine, iContact, PR.com, ad:tech conferences, Cranberry Radio, and Website Magazine. The Web Marketing Association thanks these companies for their commitment to the entire online marketing community. To enter the 20th annual WebAward Competition for Website Development, please visit our website and create a nominator account.